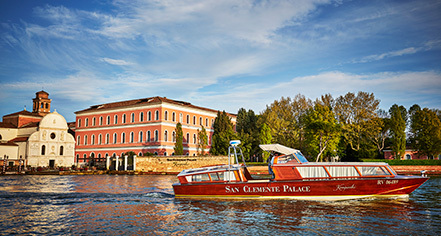 San Clemente Palace Kempinski is set on a private island in the heart of the Venetian Lagoon, only 10 minutes away from St. Mark’s Square by the hotel’s complimentary shuttle boat. The Island of San Clemente played a key role in the history of the Republic of Venice; funded in 1131, the island housed the church of San Clemente and a hospice for pilgrims and soldiers destined for the Holy Land. Between the 15th and 16th centuries, San Clemente became known as the “gateway to Venice.” It became standard practice to take the Bucentaur (Bucintoro), the Doge’s ceremonial barge, to the island to meet distinguished visitors. Most of the buildings now housing San Clemente Palace Kempinski were built between the 19th and 20th centuries. The hotel is surrounded by a number of inner courtyards, which are another reminiscence of the ancient monastery, and by a huge centuries-old park. The island is an oasis of peace: the ideal retreat from the hustle and bustle of Venice, full of tranquility and privacy, and just ten minutes by boat from St. Mark's Square. 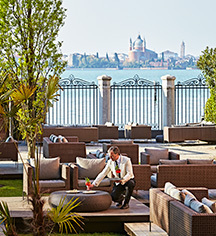 The strong connection between San Clemente Palace Kempinski and Venice and its lagoon is constantly highlighted by the hotel's decor and interior. All 190 guestrooms and suites provide a stunning view of Venice, the lagoon, the gardens, or the inner courtyards, and are decorated with typical Venetian floor “terrazzo,” Venetian-style furniture, and Murano glass chandeliers. Three restaurants and three bars cater for all culinary desires. Guests can relax and exercise in various facilities, including one of the few outdoor swimming pools in Venice, a tennis court, a pitch and putt golf course, as well as a state-of-the-art SPA. While buzzing Venice is right on the doorstep, San Clemente Island is the ideal destination for those seeking a retreat of peace and tranquility and exclusivity at the same time. San Clemente Palace Kempinski, a member of Historic Hotels Worldwide since 2016, dates back to 1131. Amongst the restored treasures of the chapel, there are paintings and frescos from various Italian artists such as Giovanni Segala, Pietro Ricci, Francesco Ruschi, and many more famous representatives of the Venetian style of art. Airport Transportation: An airport shuttle may be arranged through the hotel's concierge, EUR 130 one way per room. Hotel/Resort Fees & Taxes: A tax of 5 EUR per night is imposed by the city. This tax does not apply to residents of Venice City or to children under 10. Further exemptions may apply. Rollaways: Available upon request; EUR 150 per night. Learn more about the History of San Clemente Palace Kempinski .